Civil Litigation Lawyer in Port St Lucie, Fort Pierce FL. Fort Pierce, Florida, the Sunrise City, is a city of around 44,000 people located 27° North of the equator on the Eastern Atlantic coast of Florida. Fort Pierce has a humid subtropical climate with summer temperatures ranging between 80 and 100 degrees F and winter range between 55 and 80 degrees. Fort Pierce is part of the Port Saint Lucie Metropolitan statistical area which is estimated to have 438,095 residents. Fort Pierce is the county seat of Saint Lucie County and was incorporated in 1901 with a population then of around 300 pioneers. Fort Pierce was named after the Fort Pierce Army Post which was built nearby during the Second Seminole War in the 1830’s. Prominent industries for Fort Pierce include agriculture (citrus and cattle), fishing, light industry, and tourism. Due to the presence of the Fort Pierce Inlet providing deepwater access to the Atlantic ocean, Fort Pierce is the home of the Port of Fort Pierce, one of Florida’s 14 deepwater seaports. The Port of Ft. Pierce first came into existence in 1920 when a manmade opening, the Ft. Pierce Inlet, was cut through the land barrier between the Atlantic Ocean and the Indian River Lagoon. In January 2018, Saint Lucie County bought the 12.3 Indian River Marine Terminal within the Port for $25 million. The County is currently seeking bids for a long term partner which, over 20 or 30 years, would be responsible for finding, designing, building, equipping, maintaining and operating the port. The plan is to develop the port as a Mega-yacht repair and refurbishment facility. There has been interest shown by major players including Superyacht Technology a Fort Lauderdale mega-yacht repair company that designed the $50 million Port Antonio Shipyard in Jamaica. Saint Lucie County has more than 12,950 registered vessels with more than 1,485 in excess of 26 feet. 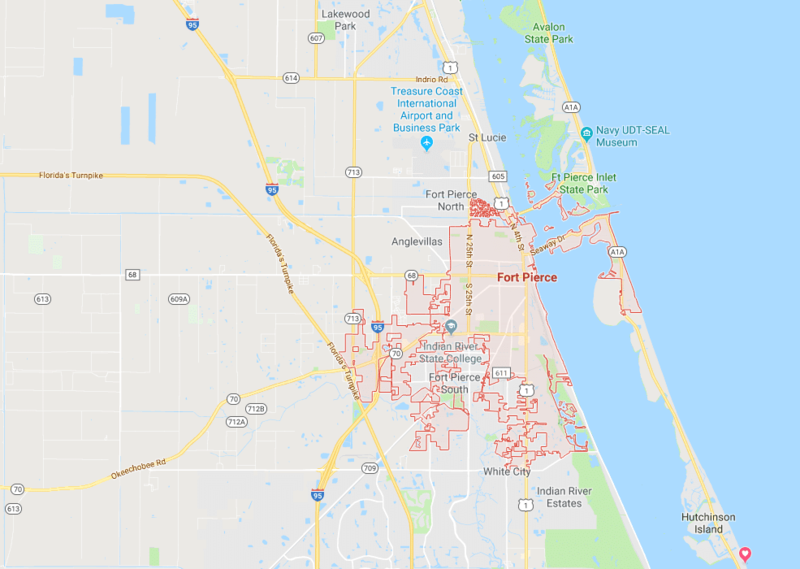 Fort Pierce is located within the “Treasure Coast” which is a three county region whose name refers to the Spanish Treasure Fleet lost in a 1715 hurricane. The beaches of Fort Pierce are some of the best ones in the whole world to find treasure. It has been estimated that $750 million of registered silver from the 1715 Fleet is still out there, waiting to found. 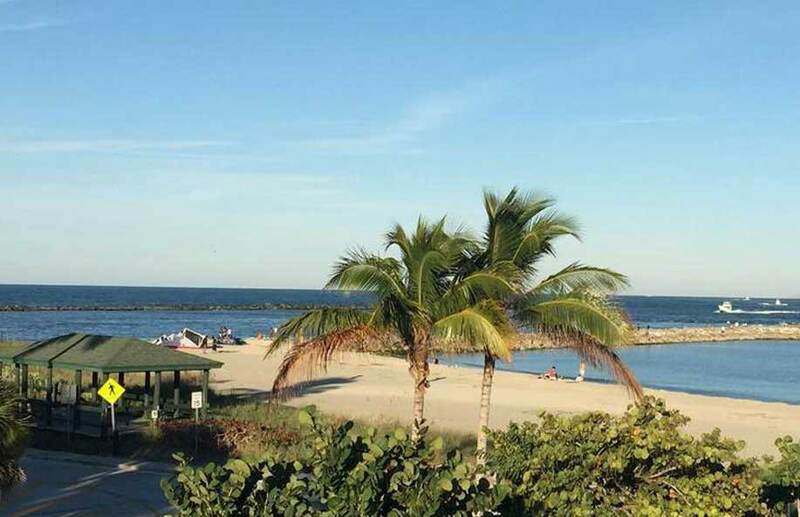 Recoveries are ongoing and recent with $1million in treasure having been recovered off of Fort Pierce as late as 2015..
Fort Pierce is a diverse and laid back community which is undergoing a bit of a renaissance with new development on its beaches, inlet, and downtown. In earlier days, there were a number of large hotels operating within the city. One of the few grand old ladies still standing is the Fort Pierce Hotel. The hotel you see today is part of a much larger hotel originally built in 1917. The building was converted to offices and is now home to a bank and other business professionals. Currently the City of Fort Pierce is seeking development plans for the HD King power plant site downtown for a high-end hotel and residential units. Fort Pierce lies on the banks of the Indian River, a 121-mile brackish lagoon which in turn forms part of the Atlantic Intracoastal Waterway. The Indian River Lagoon is very diverse with more species of plants and animals than any other estuary in North America. But, sadly the Indian River Lagoon’s health is suffering in recent years with increasing levels of phosphorus which contribute to harmful algae blooms. We hope that Florida will restore funding for water quality monitoring so that Fort Pierce will see the Indian River Lagoon nursed back to health.